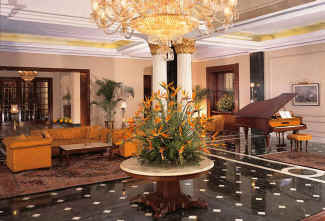 The Oberoi Grand, fondly referred as the ‘Grande Dame of Chowringhee’ offers the ultimate classical residence in the City of Joy. Standing stately for over 125 years, The Oberoi Grand combines classic Victorian architecture and charm with state of the art amenities and facilities, offering our guests an oasis of tranquillity amidst this bustling city. Located in the heart of the commercial and administrative hub of Kolkata, this heritage hotel features elegantly appointed rooms, award winning restaurants and exclusive spa and fitness centre. 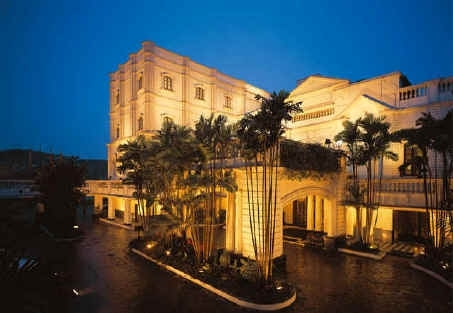 Personalised, efficient and unobtrusive service combined with the unique luxury offering makes The Oberoi Grand the preferred hotel for travellers on leisure and business alike. All our rooms come with standard features like: LCD TV, DVD Player, Satellite Channels, Wired & wireless broadband internet access, Electronic safe, Dual line telephones with voice mail, Personal bar, Personalized butler service, A well appointed bathroom with a basket of Ayurvedic toiletries. 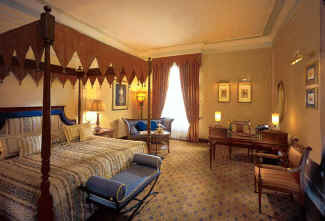 Tastefully decorated evoking Victorian splendour, the Deluxe Room offer a bird’s eye view of the city of Kolkata. Elegantly designed and furnished to provide a cosy stay to its guests this set of rooms overlook the swimming pool and the central courtyard. Besides the above mentioned facilities guests will avail additional facilities in Premier rooms which include a four poster bed, balcony and a personal fax machine. Spread over sprawling 48 square meters, each of the Deluxe suites is an ideal haven to retire and relax. The Suites feature king size poster beds and teak wood flooring, dining table, two balconies overlooking the pool and garden and a walk in wardrobe. There is also a large work-table equipped with fax machine. 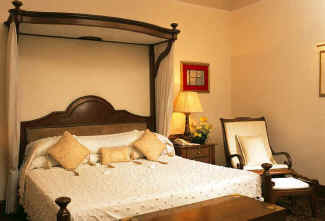 This set of rooms ideally suit both leisure and business voyagers in the city. 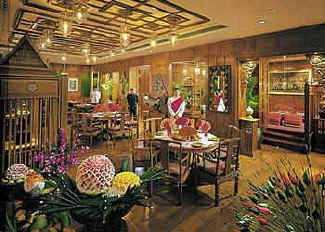 There are a wide variety of dining options available at The Oberoi Grand from our French Brasserie offering a range of international cuisine to our famous Baan Thai. La Terrasse is an exciting all day dining restaurant offering a range of international cuisine with a buffet which is open for breakfast and lunch. Awarded the best all day dining restaurant in the city it is bright and cheerful and will cater for every taste any time of day. For an authentic taste of Thailand, visit Baan Thai. Widely recognised as the premier Thai restaurant in the country. Relax here before or after dinner with friends, colleagues and a selection of fine wines, beers, spirits and cigars. 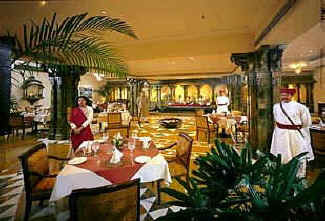 Pool bar-enjoy a light meal and refreshing drinks in the tranquility atmosphere. 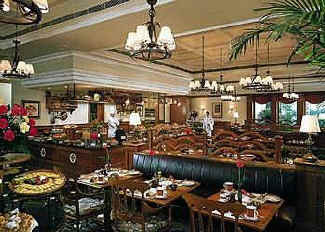 Private dinners and banquets can be arranged at the hotel. Take your body on a journey of transformation as you enter the serene and soothing haven of the Spa and Fitness Centre. Let the healing hands of trained therapists ease away the stress of hectic urban life. Get pampered with treatments based on Aromatherapy, Ayurveda, Eastern and Western techniques and feel your body and spirit get gently revitalised. Or energise yourself at the modern gymnasium that features state of the art fitness equipment. 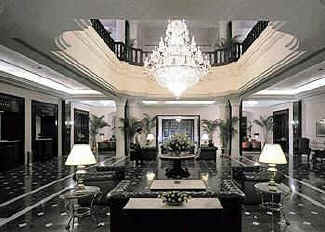 A session at The Oberoi Spa & Fitness Centre by Banyan Tree promises to leave you refreshed and rejuvenated. 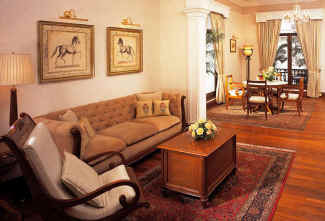 Golf, Horseriding, Squash and Tennis are all available within 15 minutes driving time of the hotel. State-of-the-art Life Fitness machines are available for guests free of charge.